>> When Should I Work With a Recruiter in my Job Search? When Should I Work With a Recruiter in my Job Search? If you are new to the job search process and wonder if you should reach out to recruiters to jump-start your job search, here are a few considerations. Recruiters generally operate under three business models and it is important to understand this before you begin. Corporate recruiters work for their own firms and companies and will be part of a human resources team in an organization supporting human resources efforts of the executive management team. Generally experts in their own industry, they recruit individuals directly for their own company. Some third-party recruiters work in a retained arrangement. They are paid directly and exclusively by their client—the firm or company with the open position. Retained searches are paid to the recruiter in full or in part before the search for a candidate begins. Other third-party recruiters work in a contingency arrangement. They are also paid and by the organization with the open position. Contingency searches are paid once a successful search is completed. Why it’s important to know this. For the purpose of this article, I am referring to third-party recruiters, rather than corporate or company recruiters. Please understand that during the recruiting process, the recruiter’s first priority is the suitability of a candidate in service to his or her client. The recruiter is not in service to the job seeker. I am not suggesting that the recruiter does not serve the job seeker, rather that his or her first priority is the interests of his client. In both retained and contingency searches, the finder’s fee (recruiting fee) is a percentage of the annual salary of the position being hired for the role. There are many types of arrangements under this model, of course. Split fees are common when a recruiter partners with another recruiter and they work together to identify an ideal candidate for the client company. Generally speaking recruiters can be an important member of your career management team and the following guidelines will help you decide whether reaching out to a recruiter will help you land faster. According to research findings presented by Gerry Crispin at the Career Thought Leaders Conference & Symposium in April 2015 in Maryland, “Guiding Clients to Meet 21st Century Recruiting Standards: Learning from the Candidate Experience”, in Canada and the US, recruiters place—on average 2 positions per month. When you consider the number of candidates the recruiter will need to speak with in order to place one position, it is easy to see that the placement rate for candidates is low. Recruiters are paid directly and exclusively by the corporations and organizations who hire them to find the right candidate. Recruiters do not get paid by job candidates. When to engage with a recruiter. 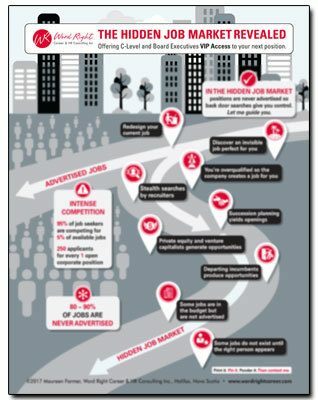 If you have a clear career trajectory that supports your value proposition. You must be ideally qualified for the opportunity. Do not leave any unanswered questions in your career documents as you approach a recruiter. You need to connect the dots between your value proposition and the needs of the recruiter’s client. You are planning a lateral step or a step up within the same industry. Industry experience is critically important to recruiters and their clients. It is accepted that between 80 and 90% of jobs are never advertised. Recruiters often have inside information about companies and organizations who are planning to hire. Some companies never advertise for candidates, but will partner with recruiters to identify ideal candidates who are currently employed. These types of candidates, called passive candidates are highly attractive to recruiters and their firms. If you want to be identified as a passive candidate, consider optimizing your LinkedIn profile with keywords that showcase your impeccable value proposition.